One of the things I love about tomato based sauces are the many ways we can re-purpose them. As an example, a delicious way to use Bolognese Tomato Sauce, other than using it with pasta, would be to use it as a stuffing for zucchini. During the summer months we have an abundance of zucchini, we use the flowers, leaves and of course… the zucchini itself. 1. Halve zucchini lengthwise and scoop out the pulp and the seeds (set aside in a medium sized bowl). 2. Mix the Bolognese Tomato Sauce with the zucchini pulp. 4. 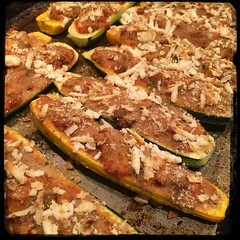 Brush the zucchini shells with olive oil, stuff with the Bolognese/zucchini pulp mixture..
5. Top with breadcrumbs, grated ricotta salata cheese and hot pepper flakes (optional), place in shallow baking pan. 6. Bake for approximately 30-45 minutes.